As a part of our brand-new Go Active timetable, our guests can get involed with a fantastic variety of activities. From Body Zorbing to Archery, there’s something for most ages to enjoy! Wondering what a Go Active break is? Click here to find out more. In this article, we’ll explain FENCING**. Think of the Three Musketeers, or even Zorro! Fencing is swordplay sport, a recreation enjoyed by those of all ages. As well as being a physical sport, fencing is also considered to be a mental workout due to strategy! Two fencers will take part in a ‘bout’ where the other will try and score points by making contact with their opponent with their weapon – but don’t worry, it’s all safe! What can I expect from my Go Active Fencing* experience? Wondering what you’ll get out of your Go Active Fencing experience? For starters, you’ll learn some exciting strategies and hone your reaction times under the supervision of our trained instructors! Your instructor will teach you how to achieve the perfect ‘en-garde’ stance, how to get your fancy footwork right and help you refine your bladework. How should I prepare for my Go Active Fencing* experience? Make sure you are comfortably dressed, as you would for any sport of physical activity, because you will be doing a lot of quick, fast movements. This means that flat, sturdy and comfortable shoes are also a must, alongside an isotonic sports drink or bottle of water to keep yourself hydrated during your Go Active experience! There’s nothing more to it than that! 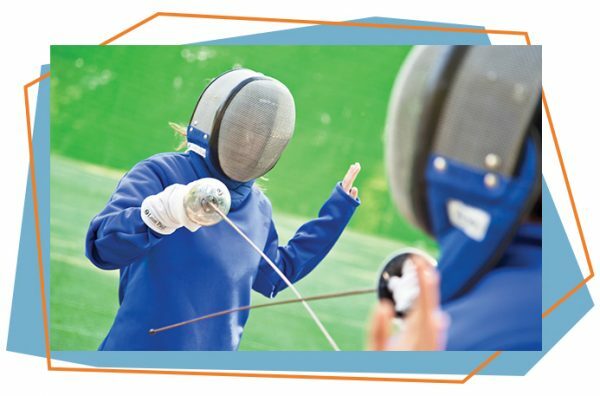 Our trained instructors are on hand to help you learn and perfect the sport of fencing! *As with all Go Active activities, charges apply. **Fencing is for 8+ year olds only.